Bernard Perlin, who has died aged 95, was an American artist whose wartime work morphed from propaganda to reportage as he confronted the stark realities of the conflicts in Europe and the Pacific. After the war he snubbed the rise of Abstract Expressionism in favour of the good life in Italy and New England. As America entered the war Perlin joined the United States Office of War Information. Placed in the Graphics Division, he produced bold, block-coloured posters and lithographs to rally the nation’s morale. 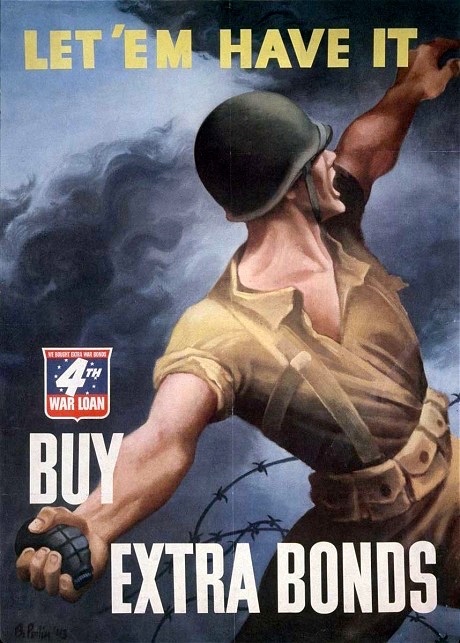 His Let ‘Em Have It sheets – in which a GI hurls a grenade while the public are called on to buy more war bonds – were to become ubiquitous across the stores and stations of the American home front. Another, from 1943, declared that “Americans Will Always Fight for Liberty” and pictured contemporary American soldiers set against a backdrop of Benjamin Franklin’s Independence troops. This patriotic delivery was to be diffused by his experiences embedded in an American commando unit in the Mediterranean. Here he drew and painted works for Time and Fortune magazines. His gouaches captured the struggle of Greek civilians – often Resistance fighters – caught behind German lines; blood-soaked operating theatres; and soldiers preparing for action picked out in the inky blue of moonlight. He explained that he would often relive a battle in his mind before committing paint to canvas. 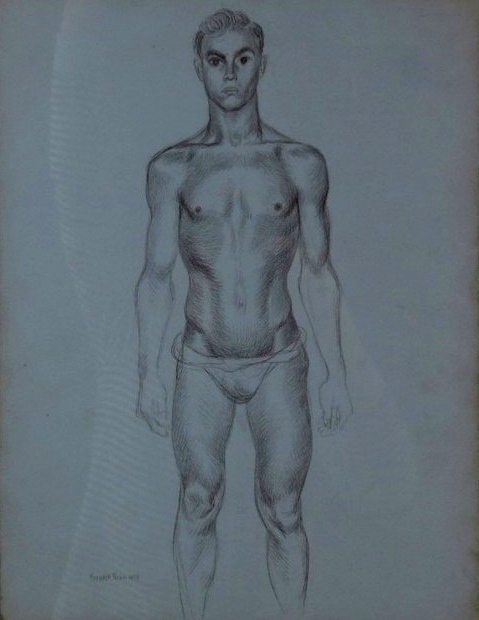 He also sketched out caricatures and portraits, including a deep-lined profile of General Douglas MacArthur. He later covered the war in the South Pacific and Asia, where he was on board the “Mighty Mo” (USS Missouri) for the formal Japanese surrender, and remained in the region to record the war’s aftermath. Bernard Perlin was born in Richmond, Virginia, on November 21 1918 into a family of Jewish Russian-émigré tailors. In 1934, after his artistic promise had been spotted at high school, he enrolled at the New York School of Design. He then studied at the National Academy of Design Art School and the Art Students League before receiving a scholarship to develop his work in Poland. On his return, Perlin was commissioned by the US Treasury to paint a vivid mural – depicting a late-1930s country scene – on a Post Office wall in the New Jersey village of South Orange (for which he was paid $2,000). It was a community project that would be a precursor to his Social Realist work during, and in the wake of, the war. After his wartime experiences Perlin’s delivery turned towards Magical Realism, an informal school with an artistic lineage that can be traced from Frida Kahlo to Edward Hopper. His aim was to capture an “everyday magic” powered by both realism and surrealism. Perhaps his most famous painting was executed in this period. 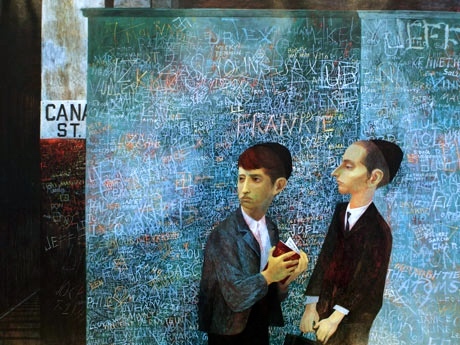 Orthodox Boys (1948) pictured two boys in their skull caps pondering a Hebrew text on a platform at Manhattan’s Canal Street subway. Behind them a wall displays a thousand doodles – from lovers’ declarations to notes by Nazi sympathisers. It is a snapshot of a specific time and culture given an almost sinister air. Perlin’s post-war career would be guided by an ever-shifting focus – both in terms of style and subject. In 1948, shortly after painting Orthodox Boys, he relocated to Italy, staying for six years, painting what he termed simply “beautiful pictures”. Social realism gave way to dreamlike images of Capri’s cliffs and the Spanish Steps in Rome and took on a new palette of deep reds and shocking greens. Returning to New York, he was confronted by a transformed art scene. Punchy, beer-fuelled Abstract Expressionists, such as Jackson Pollock and Willem de Kooning, lorded over the network of galleries and seduced – in all senses of the word – patrons such as Peggy Guggenheim. Perlin was repelled by this resolutely anti-figurative and incestuous hothouse environment. He moved to the haven of Ridgefield, Connecticut, “to escape the artificial, ego-pressured world of artists in New York, competing with each other to make the most money”. The leafy confines of New England forged an increasingly Impressionistic and contemplative approach – a 1968 portrait of Truman Capote depicts the author almost dissolving into the white sun-bleached haze of a drawing room. Perlin held teaching posts at the Brooklyn Museum Art School (1946-48) and Wooster School, Danbury, Connecticut (1967-69). His works are held in many of the world’s leading collections, including those of the Museum of Modern Art in New York. 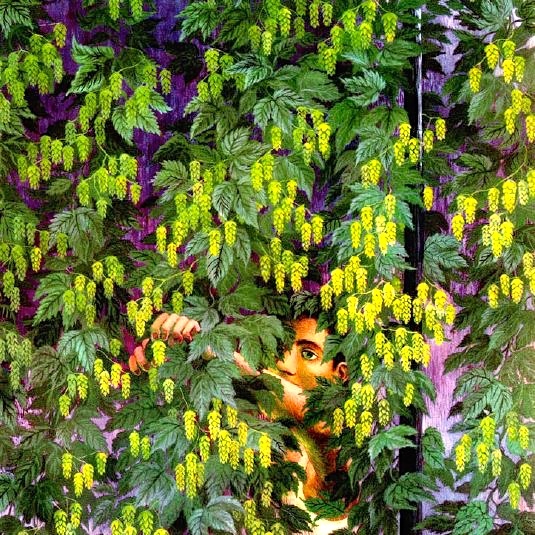 The vivid “Brewers”, with hops blossoms covering the visual field. 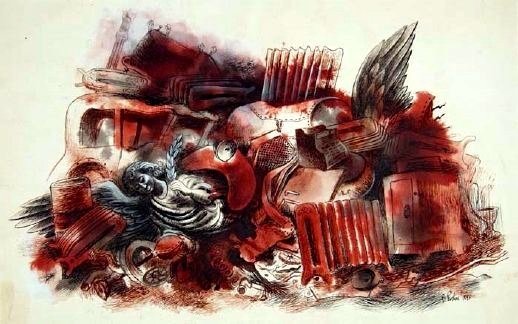 “Urban Angel”, with the disorder, even decay, characteristic of many Magic Realist works. This entry was posted on January 13, 2015 at 5:37 am and is filed under Art, Death notices, Gender and sexuality. You can follow any responses to this entry through the RSS 2.0 feed. You can leave a response, or trackback from your own site.